Wicklow beat Down by two points in the Division 2B decider at Pairc Tailteann to deliver their first piece of Hurling League silverware since 2010. Both sides finished with 14 men, with Down midfielder Fintan Conway sent off after an altercation with Jonathan O'Neill in the 64th minute. Wicklow's Christy Moorehouse got a straight red after he had lashed out on Down defender Brett Nicholson. In the group stages, Down had claimed an eight-point win over Wicklow. However, they were under early pressure in Navan and found themselves four points down with Daniel Staunton on target after just 14 seconds, before a trio of Mikey Lee scores. Conor Woods opened Down's account with the first of his two opening half points, but Wicklow continued to hold command and led by 0-7 to 0-3 after 14 minutes. Down cut the gap to two points on two occasions, with Woods, Connor O'Prey, Sean Ennis and Daniel Toner working hard. But Lee was deadly accurate from placed balls, and helped secure a 0-10 to 0-6 lead after 22 minutes, following his sixth score. Ennis and Conor O'Neill fired a trio of unanswered points to ensure a 0-10 to 0-9 score-line after 27 minutes, but points from Moorehouse and Lee handed Wicklow a three-point interval lead. This lead was quickly doubled early in the second half with Wayne O'Gorman, Staunton and O'Brien on target to create a 0-15 to 0-9 lead. O'Prey opened Down's second-half account, before Moorehouse and Toner traded scores. Toner's point came as Down fired an unanswered 1-2 in a two-minute spell. McCusker fired his third point, before this was followed up by a well-struck goal from substitute Scott Nicholson. 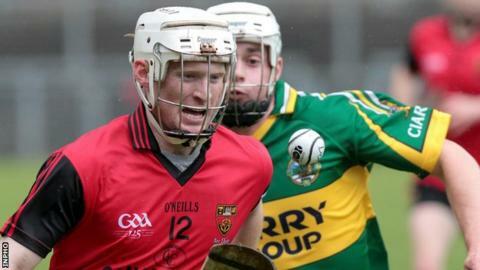 The Ballycran clubman was only two minutes on the field, before getting on the end of a move which involved Donal Hughes and McCusker in the build-up. That goal cut the gap to a point on a 0-16 to 1-12 scoreline, but Wicklow claimed a three-point advantage with quick points from O'Brien and O'Gorman inside a minute. Lee ensured a 0-19 to 1-12 lead, with his eighth point in the 47th minute, and although McCusker cut the gap once more, Wicklow continued to remain on top. Jonathan O'Neill ensured all six starting forwards were on target as he added Wicklow's 20th point, before a third from Staunton opened up a five-point lead as the game entered the final quarter. Down never gave up and claimed three of the next four points, with Woods and McCusker on target. However, frustration kicked in for Down and Conway was dismissed, after initially being shown a yellow card and a subsequent red by referee John Keane. Wicklow were dealt a blow late on with Moorehouse picking up a straight red for a challenge on Brett Nicholson.